Conversation Corner: Art - Who painted these? Do you know these paintings or who painted them? Guess and discuss. 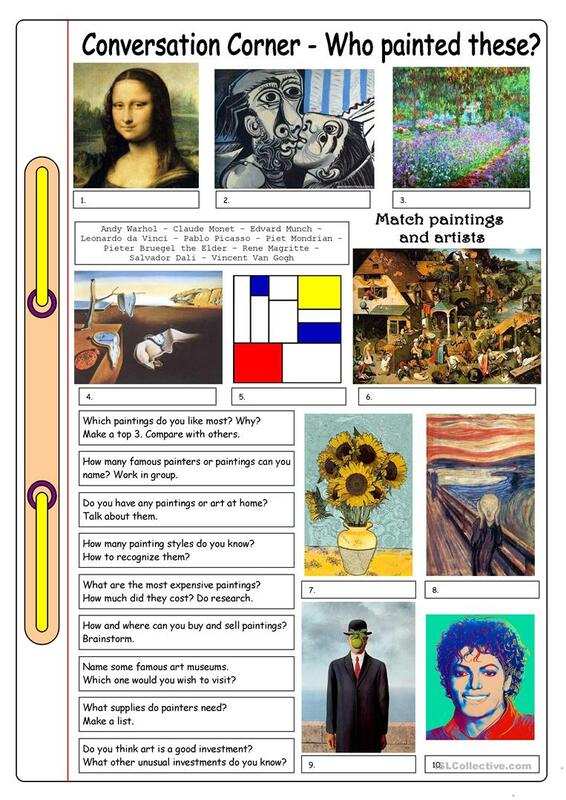 This conversation worksheet with 10 photos of paintings and 9 conversation questions can be used as a basis for an informal discussion about art, paintings, museums and more. It can be used for Internet research and/or giving short presentations as well. Teacher notes included. This downloadable worksheet is best suited for business/professional students, high school students and adults at Pre-intermediate (A2), Intermediate (B1), Upper-intermediate (B2), Advanced (C1) and Proficient (C2) level. It is valuable for practising Questions in English, and is excellent for developing your students' Listening skills. It is about the vocabulary topic of Art. The exercises come with answers.